An internal investigation into Japan’s biggest corporate scandal in years has concluded that Toshiba inflated profits by 151.8 billion yen ($1.22 billion) over several years and that top management including CEO Hisao Tanaka knew about it. The profit overstatements are roughly triple Toshiba’s estimate in April, when the company launched its probe of accounting regularities. Because of the investigation, the company has been unable to report results for the fiscal year that ended in March 2015 and scrapped its year-end dividends. In a summary report filed with the Tokyo Stock Exchange, the investigative panel said Tanaka and his predecessor, vice chairman Norio Sasaki, were aware of the overstatements and set unrealistic operating profit targets that the heads of divisions were required to meet. The improper accounting included overstatements and booking profits early or pushing back the recording of losses or charges, the report said. Tanaka vowed in June to “create a new Toshiba” in response to the accounting scandal. But Reuters reports that he and Sasaki will resign in the coming months. The scandal “could lead to the restatement of earnings plus a board overhaul and potentially hefty fines at the computers-to-nuclear conglomerate,” The Guardian said. Investigators have theorized that top executives set the unrealistic profit targets, in particular for new operations such as smart meters and electronic toll booths, because they were worried about the impact of the 2011 Fukushima disaster on their nuclear business. 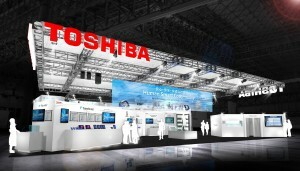 Toshiba’s shares are “almost certain” to be placed under special monitoring, a stock exchange source told Reuters. The source also said the exchange was considering a penalty for breach of contract of around 91 million yen based on Toshiba’s market capitalization. Last week, other sources said the company was expecting 300 billion to 400 billion yen ($2.4 billion to $3.2 billion) in charges including the overstated profits as well as various writedowns.